Purpose and Aim: Multi-drug resistance in treatment-experienced human immune deficiency virus (HIV) patients has been a major cause to first line antiretroviral therapy (ART) failure, necessitating a switch to second line therapy. In India, the second line treatment program is still relatively new with little experience and unclear outcomes. It is therefore, critical to assess the clinical, virological and immunological effectiveness and treatment outcome over the 1 st year of follow-up in the patients' switched to the second line ART at public sector tertiary care center. Materials and Methods: A prospective, observational study was carried out on HIV positive patients switched on second line ART from January 2010 to December 2010 at ART Centre, Civil Hospital, Ahmedabad. Demographic details, symptoms, adverse drug reactions (ADRs), second line ART regimens, CD4 count, and plasma viral load (PVL) were recorded in a case record form. Patients were followed-up monthly for 12 months. The data was analyzed by t-test, z-test, and Fisher-exact test. Results: Out of 126 patients, 82 received regimen V [zidovudine (ZDV) + lamivudine (3TC) + tenofovir (TDF) + boosted lopinavir (LPV/r)] and 44 received regimen Va [3TC + TDF + LPV/r]. A significant ( P < 0.0001) increase in mean body weight and marked reduction in number of patients (7) categorized as WHO stage III/IV was observed at 12 months of second line ART. Moreover, a significant immune reconstitution with increase in mean CD4 count and viral suppression (PVL < 400 copies/ml) in 103 (82%) patients ( P < 0.0001) was also observed. A total of 83 ADRs were observed in 69 (55%) patients, the most common being dyslipidemia (57) followed by anemia (9). Conclusion: Early treatment outcome with second line ART was good with 82% success rate in treatment experienced HIV patients. Dyslipidemia and anemia were the common ADRs observed. The second line treatment program is still relatively new with little experience in Indian population. Without resistance testing and 6 monthly virological monitoring, the consequences of second line therapy outcomes are unclear. It is therefore, critical to assess the clinical, virological, and immunological effectiveness and treatment outcome over the first year of follow-up in the patients switched to second line therapy at public sector tertiary care center. This was a continuous, longitudinal, prospective, observational, single center study conducted at Civil Hospital Ahmedabad (CHA), a tertiary care teaching hospital in an urban setting of Western India. The study was approved by Institutional Ethics Committee (IEC), CHA and granted permission by the Additional Project Director, Gujarat State AIDS Control Society (GSACS) (Ref. No. EC/A/94/10/25.10.10). HIV positive patients of more than 18 years and either gender switched to second line ART from January 2010 to December 2010 at ART center, CHA were enrolled in the study. However, pregnant women were excluded. Informed consent was obtained from all patients. The baseline data of the patients were recorded in pre-tested case record form. Each patient was followed-up every month for clinical assessment (body weight, WHO stage, opportunistic infections) and adverse drug reaction (ADR) till completion of 1 year of second line treatment. CD4 count was monitored at baseline, 6 and 12 months while plasma viral load (PVL) was tested at baseline and 6 months after switching to second line ART regimen. However, patients who failed to show virologic suppression ( <400 copies/ml) at 6 months, PVL was repeated at 12 months. Patients were offered adherence counseling at each visit. Adherence to second line ARDs was assessed by pill count. The data was recorded in Microsoft Excel Worksheet and analyzed by z-test, t-test, and Fisher's exact test. A total of 126 HIV infected patients received second line ART of which 94 were men and 32 were women. Of these, 82 was treated with regimen V (ZDV + 3TC + TDF + LPV/r) while 44 received regimen Va (3TC + TDF + LPV/r). The mean age of patients was 39.6 ± 9.4 years. Majority of the patients had habit of smoking (22), chewing tobacco (21), and alcohol consumption (7). Of 126 patients, 68 had at least one HIV positive family member; of which 43 patients were serodiscordant. The most common cause to switch on second line ART was combined immunological and virologic failure (64) followed by all three failure (44). The average time duration on first line therapy was 37.9 ± 13.9 years. Mean baseline CD4 count and PVL of patients was 123.7 ± 10.1 cells/mm 3 ( 95% confidence interval [CI]: 102.64-142.33) and 216810.9 ± 45698.2 (95% CI: 126581.63-307438.18) copies/ml, respectively. 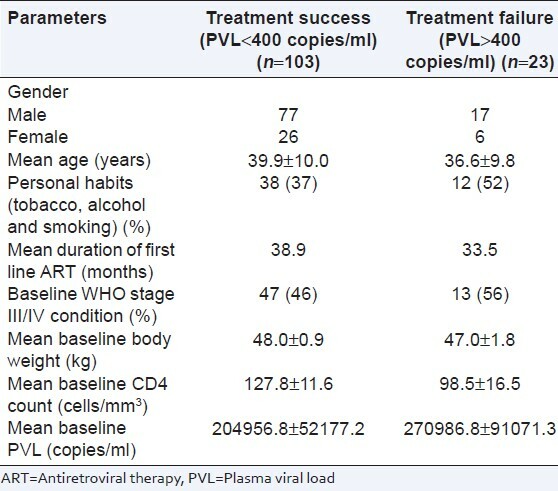 Baseline characteristics, mean CD4 count and mean PVL of patients receiving regimen V and Va were comparable [Table 1]. At second line ART initiation, majority of the patients were categorized as WHO clinical stage I (50), followed by IV (31), III (29) and II (16) [Table 1]. The most common opportunistic infection (OI) was tuberculosis (18), followed by candidiasis (2), herpes (1), and Mycobacterium avium complex (MAC) (1). Second line ART (both regimen V and Va) significantly increased mean body weight of patients at 6 and 12 months of treatment (P < 0.001 and P < 0.0001). However, mean increase in body weight at 12 months was more in regimen Va (4.9 kg) as compared to regimen V (2.2 kg) ( P < 0.01) [Figure 1]. Secondly, second line ART (both regimens) reduced the number of patients categorized as WHO stage III/IV from 60 to 27 and 7 at 6 and 12 months respectively. In addition, 11 (50%) patients were cured of OIs at 6 months while the remaining 11 got cured at 12 months. There was a significant increase in mean CD4 count at 6 months (155.4 ± 11.7 cells/mm 3 , 95% CI: 133.5-179.8) and 12 months (226.2 ± 12.4 cells/mm 3 , 95% CI: 202.9-252.0) as compared to baseline ( P < 0.0001). The increase in CD4 count was more at the end of 6 months with both regimens ( P < 0.0001). However, an increase in mean CD4 count was significantly more at 12 months in regimen Va treated patients [267.2 cells/mm 3 ( 268%)] as compared to the regimen V [204.2 cells/mm 3 ( 149%)] ( P < 0.05) [Table 2]. A significant decrease in mean PVL was observed at 6 months treatment with both second line ART regimens (P < 0.0001) [Figure 2]. Out of 126 patients, 96 (76%, 95% CI: 68-83) patients achieved virological suppression (PVL < 400 copies/ml) at 6 months and 103 (82%, 95% CI: 74-88) at 12 months. In regimen V, 65 (79%, 95% CI: 69-87) patients achieved virological suppression at 6 months and 69 (84%, 95% CI: 75-91) at 12 months. While in regimen Va, 31 (70%, 95% CI: 56-82) patients achieved virological suppression at 6 months and 34 (77%, 95% CI: 63-87) at 12 months. An attempt was made to predict the variables associated with viral suppression. Of 103 patients with viral suppression ( <400 copies/ml) at 12 months, 98 (78%, 95% CI: 70-84) patients also showed increase in mean body weight and CD4 count. This was comparable with both regimens (63 [77%, 95% CI: 67-85] in regimen V and 35 [81%, 95% CI: 65-89] in regimen Va). It was found that poor personal habits (tobacco, smoking, and alcohol), WHO stage III/IV condition, low baseline CD4 count and high baseline PVL were associated with poor treatment outcome in terms of failure to achieve virological suppression [Table 3]. A total of 83 adverse drug reactions (ADRs) were observed in 69 (55%) patients during the study period. The most common ADR was dyslipidemia (57) followed by anemia (9). Out of 83 ADRs, 55 were reported from regimen V, while 28 were reported from regimen Va. Out of 83 ADR reports, 66 were serious, while 17 were non-serious according to WHO classification. All ADRs were mild according to modified Hartwig and Siegel scale. Causality assessment showed that majority of ADRs were categorized as possible in nature (77) while 6 were doubtful as per by WHO- Uppsala Monitoring Centre (UMC) scale. The pill count showed that the majority of patients (94%, 95% CI: 89-97) on second line ART were adherent to the treatment with more than 95% compliance. The number of tablets to be consumed by each patient per day in regimen V and Va was 7 and 5, respectively. As HIV disease steps into third decade, there are more number of patients living on lifelong ART and facing the threat of drug resistance with subsequent treatment failure. As the extent of ART in developing countries continues, and the number of patients switching to second line therapy will inevitably increase. 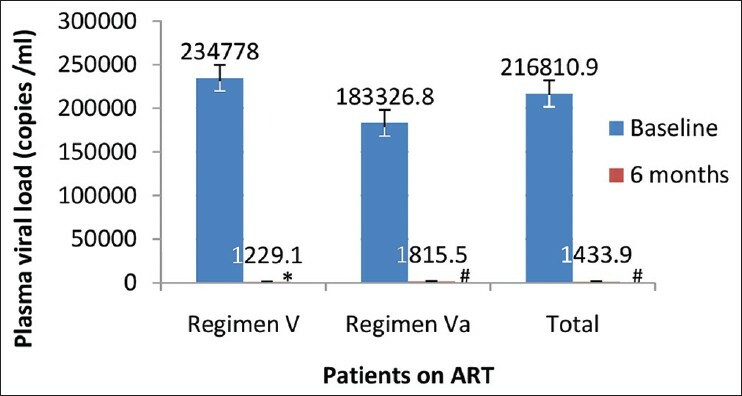 Our study shows an analysis describing the outcomes of 126 patients on second line LPV/r-based ART regimens for 12 months treated at public sector hospital in Ahmedabad, Gujarat state, India. After 12 months of follow-up on second line regimens, all 126 patients remained on treatment with no deaths or drop outs. Of 126 patients, 103 had undetectable viral loads, giving an 82% (95% CI: 74-88) treatment success rate. A strong immune reconstitution (349.9 ± 11.5 cells/mm 3 ) with clinical improvement (body weight, WHO stage and OI) was observed at 12 months of follow-up on second line ART regimens. The immunologic and virologic data supports our observation that the patients were indeed adhering well (>95%) despite high pill count (7 and 5) and difficulties to store LPV/r. Out of 126 patients, 60 had clinical failure while 116 and 117 had immunological and virological failure respectively at the start of therapy. 40% patients were asymptomatic at the time of enrolment indicating that clinical failure manifest at late stage and is a poor indicator to diagnose first line treatment failure. Although second line ART regimen is well tolerated, dyslipidemia and anemia need a close watch. Dyslipidemia with protease inhibitors (PIs) has been reported to be approximately 60% in various studies and the risk increases with combination of PIs as compared to single PI. ,, Anemia was reported in 11% patients receiving ZDV-based regimen (regimen V). This is similar to existing incidence (16.2%) of ZDV-induced anemia in Indian patients. However, high incidence of anemia mandates close monitoring of patients receiving ZDV-based second line ART. An attempt to find out the relation between variables and treatment failure (PVL more than 400 copies/ml) showed that low baseline CD4 count low, WHO stage (III/IV), younger age and poor personal habits (smoking, alcohol and tobacco) were associated with high incidence of treatment failure. Low baseline CD4 count and baseline WHO stage III/IV are indicators of poor immunological and clinical status of the patients respectively. We observed that 52% of patients having treatment failure had personal habits (smoking, alcohol and tobacco) while it was less (37%) among successfully treated patients. However, further studies are required to correlate younger age and personal habits as predictors of treatment failure of second line ART. 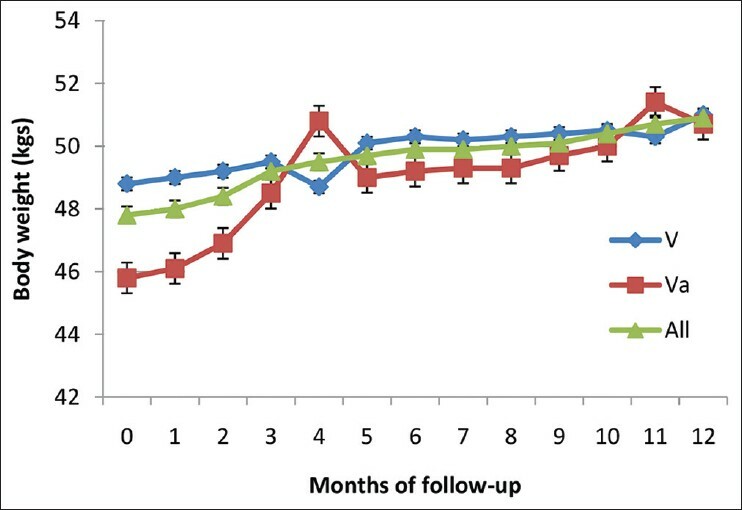 Thus, a good number of patients on second line ART were followed-up for 12 months. Although it was an observational, single center study, our findings are able to establish the early treatment outcome of second line ART and a few useful suggestions. The success rate of second line ART regimen was 82%, which is quite satisfactory and comparable with other second line ART regimens. Second, it was found that both the regimen were comparable in achieving viral suppression. Further, improvement in body weight and CD4 count was more in regimen Va as compared to regimen V. These findings suggest that addition of ZDV to second line regimen (3TC + TDF + LPV/r) provide no additional benefit in terms of efficacy but instead increase the risk of anemia and pill burden. Thus, omission of ZDV from the second line regimen may be considered to reduce financial burden to ART program. Third, definition of first line treatment failure also needs revision for continual viral suppression and effective management of treatment-failure patients. Thus, it can be concluded that the second line ART regimen has satisfactory early treatment outcome with respect to immune reconstruction and viral suppression. However, further research is needed to determine if these early outcome can be sustained over the following years of treatment. We would like to thank the Gujarat State AIDS Control Society (GSACS) for granting us permission to carry out the work. The authors would also like to thank all the patients who participated in this study. 1. History of HIV and AIDS in UK 1996 onwards, 2011. Available from: http://www.avert.org/ukaids.htm. [Last accessed on 2012 Jul 7]. 2. Fauci AS, Kasper DL, Longo DL, Braunwald E, Hauser SL, Jameson JL, et al., editors. Human Immunodeficiency Virus Disease: AIDS and Related Disorders. Harrison′s Principles of Internal Medicine. 17 th ed. New York: McGraw Hill; 2008. p. 1149-51. 3. Desai M, Iyer G, Dikshit RK. Advances in antiretroviral drugs. Indian J Pharmacol 2012; 44:288-98. 4. Radhakrishnan P. India and second line ART: evaluating the way forward. India: The Department for International Development; 2007. 5. List of countries by HIV/AIDS prevalence rate, 2012. Available from: http://en.wikipedia.org/wiki/List_of_countries_by_HIV/AIDS_adult_prevalence_rate. [Last accessed 2012 Jun 9]. 6. India HIV and AIDS Statistics, 2011. Available from: http://www.avert.org/india-hiv-aids-statistics.htm. [Last accessed on 2012 Apr 23]. 7. NACO. National guidelines on second line ART. Ministry of Health and Family Welfare, Government of India; 2011. 8. Sungkanuparph S, Manosuthi W, Kiertiburanakul S, Piyavong B, Chumpathat N, Chantratita W. Options for a second-line antiretroviral regimen for HIV type 1-infected patients whose initial regimen of a fixed-dose combination of stavudine, lamivudine, and nevirapine fails. Clin Infect Dis 2007;44:447-52. 9. 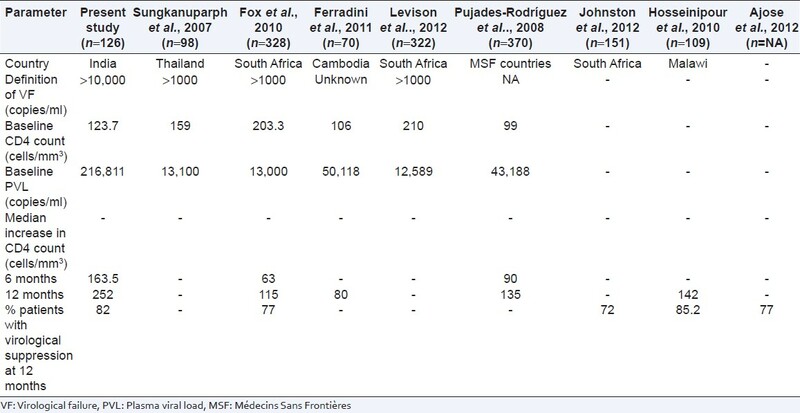 Pujades-Rodríguez M, O′Brien D, Humblet P, Calmy A. Second-line antiretroviral therapy in resource-limited settings: The experience of Médecins Sans Frontières. AIDS 2008;22:1305-12. 10. Fox MP, Ive P, Long L, Maskew M, Sanne I. High rates of survival, immune reconstitution, and virologic suppression on second-line antiretroviral therapy in South Africa. J Acquir Immune Defic Syndr 2010;53:500-6. 11. NACO annual report 2010-11. Available from: http://www.nacoonline.org/Quick_Links/Directory_of_HIV_Data/. [Last accessed on 2012 Aug 10]. 12. Levison JH, Orrell C, Gallien S, Kuritzkes DR, Fu N, Losina E, et al. Virologic failure of protease inhibitor-based second-line antiretroviral therapy without resistance in a large HIV treatment program in South Africa. PLoS One 2012;7:e32144. 13. Ajose O, Mookerjee S, Mills EJ, Boulle A, Ford N. Treatment outcomes of patients on second-line antiretroviral therapy in resource-limited settings: A systematic review and meta-analysis. AIDS 2012;26:929-38. 14. Ferradini L, Ouk V, Segeral O, Nouhin J, Dulioust A, Hak C, et al. High efficacy of lopinavir/r-based second-line antiretroviral treatment after 24 months of follow up at ESTHER/Calmette Hospital in Phnom Penh, Cambodia. J Int AIDS Soc 2011;14:14. 15. Johnston V, Fielding K, Charalambous S, Mampho M, Churchyard G, Phillips A, et al. Second-line antiretroviral therapy in a workplace and community-based treatment programme in South Africa: Determinants of virological outcome. PLoS One 2012;7:e36997. 16. Hosseinipour MC, Kumwenda JJ, Weigel R, Brown LB, Mzinganjira D, Mhango B, et al. Second-line treatment in the Malawi antiretroviral programme: High early mortality, but good outcomes in survivors, despite extensive drug resistance at baseline. HIV Med 2010;11:510-8. 17. Martínez E, Domingo P, Galindo MJ, Milinkovic A, Arroyo JA, Baldovi F, et al. Risk of metabolic abnormalities in patients infected with HIV receiving antiretroviral therapy that contains lopinavir-ritonavir. Clin Infect Dis 2004;38:1017-23. 18. Carr A, Samaras K, Burton S, Law M, Freund J, Chisholm DJ, et al. A syndrome of peripheral lipodystrophy, hyperlipidaemia and insulin resistance in patients receiving HIV protease inhibitors. AIDS 1998;12:F51-8. 19. Graham NM. Metabolic disorders among HIV-infected patients treated with protease inhibitors: a review. J Acquir Immune Defic Syndr 2000;25:S4-11. 20. Agarwal D, Chakravarty J, Chaube L, Rai M, Agrawal NR, Sundar S. High incidence of zidovudine induced anaemia in HIV infected patients in eastern India. Indian J Med Res 2010;132:386-9.